Brooklyn Brewery’s Sorachi Ace Saison will pour from Peaks and Pints’ tap log Monday night. The Brooklyn Brewery and Ecliptic Brewing tap takeover is going down Monday, April 1 inside Peaks and Pints’ little lodge in Tacoma’s Proctor District. It’s true. Ecliptic picked Peaks and Pints to showcase their newest Cosmic Collaboration series, “5 Beers for 5 Years,” in which the Portland brewery collaborates with five other esteemed breweries to brew five celestial concoctions, then taking each collaboration on separate tours supported by tapped craft beer from both breweries. 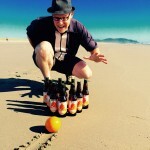 Brooklyn Brewery certainly didn’t tell famed Brewmaster Harris no; the two breweries brewed an amazing Tangerine Farmhouse Ale to kick off the first tour, which Peaks and Pints will host the Tacoma release party April 1. Read our story on “5 Beers for 5 Years” here. Brooklyn Brewery Sorachi Ace Saison will pour from Peaks and Pints Western red cedar tap log at 6 p.m. Monday, April 1. No joke. Brooklyn Brewery is one of New York’s first post-Prohibition craft breweries. Started by Steve Hindy and Tom Potter in 1988, Brooklyn Brewery hired the nattily dressed Garrett Oliver as their brewmaster in 1994 and have reaped a great deal of success ever since. Especially in 2014, when Oliver won the James Beard Award for excellence in the category “Outstanding Wine, Beer or Spirits Professional.” Basically, Brooklyn Brewery reintroduced Brooklyn palates to locally made beer, and in many ways revitalized Williamsburg as a whole (things were not always tres chic there). As you enjoy the bright tangerine and balanced farmhouse spice of the Ecliptic/Brooklyn Tangerine Farmhouse Ale Monday, your jaw will drop when you see Brooklyn’s famed Sorachi Ace Saison pouring from our Western red cedar tap log. Sorachi Ace is one of the most popular and highly rated beers made by the brewery. The namesake hop, originally developed in Japan for Sapporo Breweries in the 1970s, gives this dry, effervescent saison its distinct lemony aroma, with the Saaz-like spicy pepper character really kicking in when you finally let your tongue in on the action. There are also pronounced traces of honey and pear, and dill, which might not be strictly necessary, but it definitely does no harm and adds a layer of complexity that elevates Brooklyn Sorachi Ace into the highest ranks of American farmhouse ales. Also pouring at the Ecliptic Brewing And Brooklyn Brewery Tap Takeover will be Brooklyn’s Lager, Bel Air Sour, and Black Chocolate Stout. Ecliptic’s Flamingo Planet Guava Blonde Ale, Vega IPA #1: Cashmere & Strata Hops, and Phobos Single Hop Red Ale will be icing on the fifthwery, craft beer, tap anniversary cake.